It is a dystopian finishing school, where they finish the heck out of difficult young women. Sure, it is creepy, but at least the amenities are super-luxurious and the views are postcard-worthy. 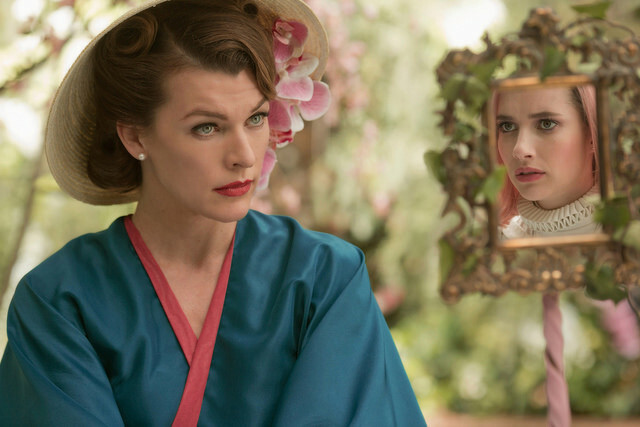 Uma, the cash-poor heiress refuses to be seduced by such trappings in Alice Waddington’s Paradise Hills, which premiered at the 2019 Sundance Film Festival. Uma is the picture of a perfectly subservient bride, but she was not always like this. Cue flashback. Initially, she had no intention of marrying her slimy groom, because she rather resented the role Son played in her father’s economic ruin and subsequent suicide. Her mercenary mother is all for the match, but Uma rather crassly still carries a grudge. It will be the job of Paradise Hills, under the direction of the regal Duchess, to mold her into a more reasonable young woman. She is not there by choice and she cannot leave of her own accord. However, she makes fast friends with her roommates. Yu is a former prole, who must learn to behave in a manner befitting the upper class now that she has been sent to live with her Beijing relatives. Chloe has been shipped away to shed the pounds her family finds so undesirable. Probably the hardest case currently in residence at Paradise Hills (technically an island, perhaps in the Mediterranean) would be Amarna, a pop starlet, who wants to chart a more Melissa Etheridge course for her career (and private life), much to the horror of her management. There is definitely an ambiguous something going on between her and Uma, until Amarna is suddenly discharged and acting like a bubblegum idol in the media. The art direction and frilly costuming of Paradise are to die for, but it blends fantasy and science fiction in ways that do not conform to any consistent internal system of logic. Frankly, it is a bit surprising the screenplay was co-written by mad genre master Nacho Vigalondo (along with Brian DeLeeuw, writer of Curvature and Some Kind of Hate), because it really looks like the film started with its feminist message and built its narrative structure out from there. Emma Roberts is so dull and vanilla as Uma, it is hard to fathom why the villainous Son would be so preoccupied with her. In contrast, Eiza Gonzalez smirks and smolders with electric intensity as Amarna and Mila Jovovich chews the scenery with devilish delight as the ab fab Duchess. Danielle Macdonald has some poignant moments as Chloe, but Awkwafina never really elevates compulsively earphone-wearing Yu above stock character levels. Of course, all the guys in Hills are either pigs or dogs. Waddington is a gifted stylist, whose ultra-chic, darkly sinister short film Disco Inferno played at Slamdance in 2016 (proving the cross-pollination between the two fests). Josu Inchaustegui’s cinematography perfectly evokes a fantastical vibe, filtered through a high-end fashion magazine layout. It is the sort of film we want to admire, but it never fully lands. Still, it proves Waddington still has loads of potential to make distinctive genre films. Sort of half-recommended, Paradise Hills is certain to have a robust life on the festival circuit, following its premiere at this year’s Sundance Film Festival.